Motorcycle Biker Birthday Printable Party - Custom - SALE! 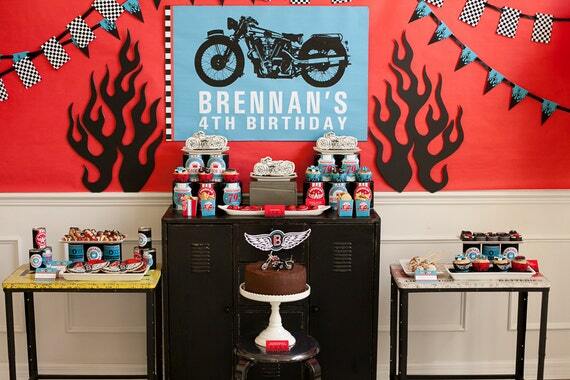 Motorcycle mayhem will ensue with this motorcycle themed printable party pack. Perfect for wild childs and those persons that may have been born to be wild and perhaps Harley Davidson lovers. 1. Find fabulous DIY printable invitation on Frog Prince Paperie's (FPP) Etsy site and purchase. 2. Send FPP your customization information in your check-out notes. 3. Once payment is finalized, FPP will send you a low-res proof of your invitation. We require 24 hours between revisions, so please budget for this! Proofs, revisions and invite approval can take up to 2-3 days. 4. Upon your approval of the invitation, DIY 300dpi high-resolution files of your invitation will be sent to the email address attached to your esty account. 5. Jump for joy that you now get to start printing for your party! The files are formatted to print on 8.5x11 white cardstock. You’ll need a printer (your or the nearest office supply store’s), and a sharp pair of scissors or paper cutter and A7envelopes to match your invitations. 2inch circle scrapbook punches are needed if you don't have a steady hand with your scissors! This listing includes the first proof and 1 (one) revision. Each additional revision that is not due to our editing and design work will incur an additional fee.